BEIJING, Aug. 1 (Xinhua) -- Onboard the C2022 train, train attendant supervisor Xu Ying walks down the aisles to check luggage safety and sanitation conditions. The high-speed train, running at over 300 km per hour, takes 35 minutes from Tianjin to Beijing. Passengers read magazines, bury themselves in their phones or simply doze off, while waiting to arrive. "Now people are used to high-speed trains, but the situation was different 10 years ago," Xu said. "Many left their seats to look here and there. Even the bathrooms became 'resorts.'" On Aug. 1, 2008, the Beijing-Tianjin high-speed train service opened, China's first high-speed railway line. Many passengers, including those from abroad who came to watch the Beijing Olympics that year, simply wanted to experience travel by high-speed train. "They kept staring at the display showing the train speed and watching outside to feel the train speed," Xu said. Some passengers even excitedly asked Xu to pose for photos with them. David Feng, a Swiss teaching at a Beijing university, wrote about his feelings onboard the fast train on that day. "Speeds maxed out at 348 km/h near the northern suburbs of Tianjin. It took me around just 30 minutes to change cities - something basically impossible to believe until that day." The daily frequency of Beijing-Tianjin intercity trains has increased from 94 one-way services to 217, with 250 million passengers carried in the past decade, according to the Beijing railway bureau. Njeri Kamau, from Kenya, teaches English at a kindergarten in Tianjin. She takes the high-speed train every Friday afternoon to meet her husband who works in Beijing. "The high-speed train has made it so much easier to maintain the long distance [relationship]," she said. The first high-speed railway in north China's Inner Mongolia Autonomous Region was completed Tuesday. The 287-km-long railway passes the regional capital of Hohhot, the region's Ulanqab City, and Zhangjiakou City in neighboring Hebei Province. It is expected to start operation at the end of 2019 along with the Beijing-Zhangjiakou high-speed railway. The two lines will reduce the travel time between Beijing and Hohhot from the nine hours to three hours. By then, all provincial-level regions on the Chinese mainland will have high-speed trains, except the autonomous region of Tibet. The length of high-speed railway lines in China increased from zero 10 years ago to 25,000 km by 2017, accounting for 66 percent of the world's total. Over 4,000 bullet trains run in China, carrying 4 million passengers every day, according to the China Railway Corporation. When Han Yonghui first left his home in Xiangfen, north China's Shanxi Province, to open a small restaurant in 1997, he had to walk for an hour to the nearest train station, wait in line overnight to buy a ticket, before boarding a packed slow train that took him to Tianjin in 18 sweltering hours. All that changed in 2014 when high-speed trains reached Han's hometown, cutting his travel time to Beijing, where he runs his restaurant, to six hours. "My high-school children are able to come to visit every summer vocation," said Han. 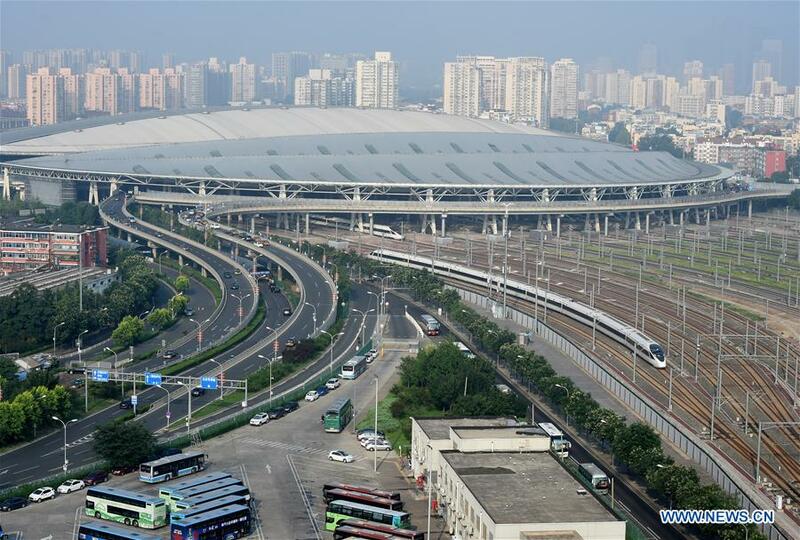 High-speed railway connecting Beijing and Guangzhou has shortened the traveling time across the 2,300-km distance to eight hours. The new Fuxing bullet trains travel at 350 km/h, going from Beijing to Shanghai in four hours and 18 minutes. By 2020, China's high-speed rail length is expected to reach 30,000 km, covering 80 percent of major cities. A network of eight east-west high-speed railway lines and eight north-south lines will be built, according to a railway development plan. High-speed rail has helped with the integrated regional development of Beijing, Tianjin, and Hebei Province, a national strategy initiated in 2014. Wang Ye, from Beijing, takes the C2205 to work every morning. In 24 minutes, the train takes her to Wuqing District in Tianjin, where Wang works at Tieke Zongheng, a train part manufacturing factory. Among the 150-plus employees in the factory, more than 20 commute from Beijing to the company every day. "High-speed trains have made the cross-city commute possible," Wang said. Wuqing has attracted more than 8,200 projects from Beijing over the past five years, including Tieke Zongheng. Investment in these projects has totaled 51.6 billion yuan (7.6 billion U.S. dollars), according to the district government. The region of Beijing, Tianjin, and Hebei Province has showcased the high-speed railway economy. High-speed rail is symbolic of the new structure of the Chinese economy, influencing all aspects of society. By the end of 2017, China's high-speed trains had carried more than 7 billion passengers. Cargo delivery via high-speed trains started in 2016, with more than 500 cities used as pilot areas for express services. China's high-speed railway has also gone global. In 2014, China completed the construction of its first overseas high-speed rail in Turkey. In June 2015, China and Russia inked deals for 770 km of track connecting Moscow and Kazan. In October 2015, China and Indonesia signed a joint-venture on the construction of a high-speed rail between Jakarta and Bandung. Huang Yanghua, an associate researcher at Chinese Academy of Social Sciences, believes high-speed rail had saved time, helped integrate the regional economy, boosted the flow of talent and information, and reshaped China's economic map.